Recorded at Arny's Shack, Parkstone, Dorset, UK. Hamsprachtmuzic on A3 by Danielle Dax, courtesy of the Lemon Kittens. Extracts from the Sherborne House talks by J.G. Bennett courtesy of Elizabeth Bennett. First copies included a post card and a A4-sized sheet featuring a text for the band reprinted from Rolling Stone magazine (Sept. 4th 1980). Matrix / Runout (Side B runout Variant 2): EDEG9 B//2 ∇E SC 11 2 SOUND CLINIC THE NEXT STEP IS DICIPLINE. 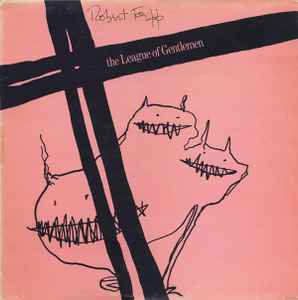 Why Why Why did this never get a CD release, but rather the a comp of League of Gentlemen. It's just not the same without kicking off with Indiscreet 1. Don't get me wrong... the God Save the King comp is very good, as is the CD release of Exposure, but damn, I loved this album on its own, as arranged. The vinyl's cheap at least, but nothing reissued beyond 1981.